Robert Lee Hall's Exit Sherlock Holmes offered up a sci-fi resolution to the mystery of Sherlock Holmes and Professor Moriarty. This is the 1979 U.S. paperback edition with nicely atmospheric cover art by Jordi Penalva. Through the sounds and fogs of Victorian London and a tangled maze of deception, the resurrected Sherlock Holmes and his archenemy, the wicked Professor Moriarity, once again engage in a terrifying battle between good and evil. 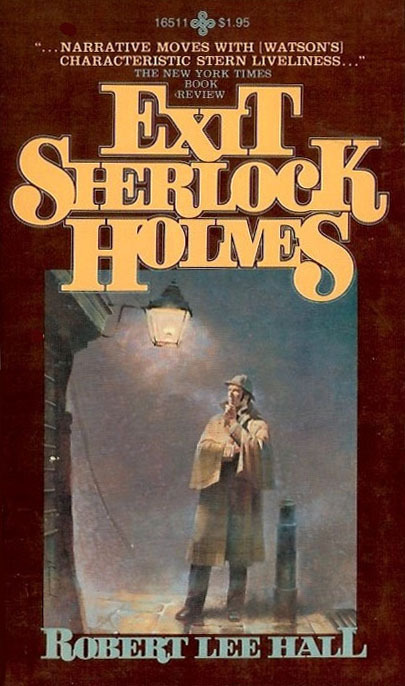 When the master sleuth decides to "disappear" in order to deal with the villain, his loyal assistant, Dr. Watson, frantically searches for him, traveling deep into Holmes' mysterious past, until he must face the shocking discovery that his old friend has lied to him for years about who he really is and where he comes from. Indeed, Watson learns the master's incredible lifelong secret–a truth which is, in the Great Detective's own words, "infinitely stranger than anything which the mind of man could invent."